Part two of our ten-part series deals with information that must be excluded from Consumer Reports (i.e. background checks). 1. Cases under title 11 [United States Code] or under the Bankruptcy Act that, from the date of entry of the order for relief or the date of adjudication that are ten years older than the report. 2. Civil suits, civil judgments, and records of arrest that are seven years older than the report or until the governing statute of limitations have expired. Whichever situation is the longer period? 5. Any other adverse item of information, other than the records of conviction of crimes which are seven years older than the report. 1. A credit transaction involving, or which may reasonably be expected to involve, a principal amount of $150,000 or more. 2. The underwriting of life insurance involving, or which may reasonably be expected to involve, a face amount of $150,000 or more. 3. The employment of any individual at an annual salary which equals, or which may reasonably be expected to equal $75,000, or more. employers should be aware that are certain occasions. An individual may have adverse information in their history that is not reportable. 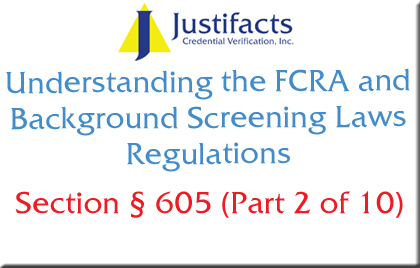 The FCRA protects consumers or applicants from having outdated information used against them.